Action figures normally aren't funny, but McFarlane's Halo Anniversary piece is good for a chuckle. Better still, it'll also be sold as part of a three-pack, each figure depicting Master Chief as he's appeared in the three main Halo games. Due for release later this year, the bundle includes three figures each his own assortment of weapons, including an assault rifle, dual SMGs, frag grenades, and a shotgun. 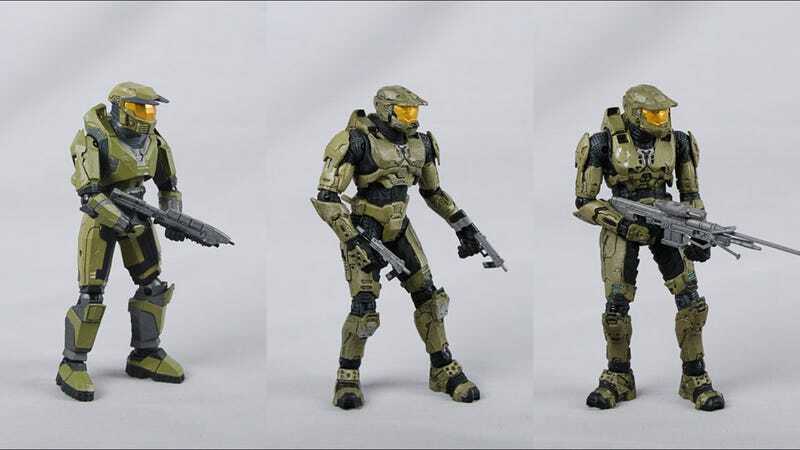 To help keep things in line, McFarlane have re-sized the sculpts from earlier Master Chief figures to match those of its more recent offerings, meaning these three will be the same size as the Spartans from their Halo: Reach line.